As we all know Step Up 3D hit theatres this weekend, and being the dancer that I am I went and saw it Saturday afternoon. I was a little bit skeptical about the movie being in 3D but I decided to give it a chance, and I’m glad I did. The movie was awesome with some amazing dance numbers. Compared to the first two movies the third installment has a lot more dancing, so the storyline lack a little but it really doesn’t matter. I could just flat out review the entire movie but I really don’t want to spoil the movie for everyone. However I will talk about the dancing. We all know there is a good amount of SYTYCD Alumni in this movie. Nine to be exact, Tony Bellissimo, Musa Cooper(who isn’t credited for being an extra), Cedric Gardner, Ashlee Nino, Ivan Koumaev, Katee Shean, Joshua Allen, Legacy, and of course Twitch. Twitch makes his acting debut playing a character named Jason. Twitch is a good actor, which really doesn’t surprise me. Though I did love the fact that his character like to wear glasses with punched out lens just like Twitch. His dancing in this movie is off the charts, insanely good and reminds you why he is an All Star this season and quite possibly the best hip-hop dancer to dance on the SYTYCD stage. Much to my surprise Twitch is not the only one that has a speaking role. Joshua and Legacy had some lines as well. Some of the other dancers are easy to spot compared to others, so pay close attention to all of the dance scenes to find them; I know I didn’t spot them all. Also be on the look out for Dave Scott to show off his dance moves. Dave is also one of the choreographers and has been involved with all three of the Step Up movies. There are other recognizable faces from the first and second movie. You might recognize Harry Shum Jr. (Cable) from glee. Then there is Kendra Andrews, if you are DWTS fan she is Erin Andrews’s sister. Overall if you are a dancer or if you like dancing then this movie is a must see. If you aren’t a big fan of the 3D movement this movie is also being shown in 2D. I suggest seeing it in 3D it make the dance numbers that much cooler. Oh and if you want to save money try checking out a matinee showing they are usually cheaper. I’m have to agree with Lauren with what she said after seeing the movie…it might just be my new favorite dance movie. Jose and Billy are eliminated to the goodbye song: Black Gold‘s “Shine” – from their album Rush. All of all Season 7’s music can be found in one place, just for you. Of course, we’re all talking about SYTYCD!! It’s only just started, but already we’ve seen some amazing things. Here’s a bit of the Internet buzz, all in one place just for y’all. Do you remember my Odd and Random 5/7/10 post, where I mentioned that the Los Angeles Ballet had hired SYTYCD choreographers for a special showcase? Well, here is a great review of the showcase. Lyndsey Parker of Reality Rocks has a great video of Mia talking about her SYTYCD return. There are cool pics, too. Dance Spirit Magazine’s Alison Feller lists her personal All-Stars, kinda like I did, before they were all announced. Here’s a cute interview with Twitch where he confesses how he remembers all his choreography. After that, Jake Pavelka and Chelsie Hightower dance, accompanied by Dmitry Chaplin and Vienna, Jake’s fiance. There is a whole lot of reality show interaction going on here: The Bachelor and his bride-to-be performing on DWTS with two pros who got their TV start on So You Think You Can Dance. Meta! Here’s Mary talking about domestic issues for the Lancaster Eagle-Gazette. “Guys, I want to say thank you to my co-judges and the man who started it all, who’s probably off snogging some lady in a bathroom, Nigel Lythgoe,” Shankman shouted as the familiar strains of the ‘Dance’ theme song filled the lounge. Billy’s family would like to thank all of the fans that came out to show their support for Billy this season. It has been an amazing experience for all of us and has really meant a lot to Billy. We feel like Billy made it through all of the tough auditions and now that the fun was beginning, he has to leave the show. We were all very disappointed when we heard the news and Billy was devastated when his doctors told the show that if he continued to dance on the show before he recovered, he could possibly die. It will take several weeks for him to recover and as a result, he will be unable to return to Juilliard as of right now. We are hoping he will be able to return in the Spring. Billy is still quite ill but was released from the hospital today. He’s feeling better but still needs to rest. As of right now, Billy is hoping to re-audition for Season 7. He really enjoyed working with the show and had a lot of fun. Although he is sad that he will not be a part of Season 6, he hopes that the producers will allow him to return for the next season. If you would like to wish Billy a speedy recovery, I’m sure he would appreciate it. 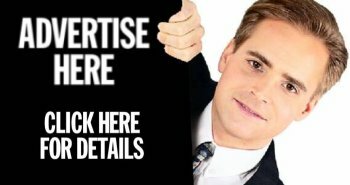 You can do so by posting on the facebook fan page or his facebook. Thank you so much for sharing your love and support with our family. This does raise an important question. In Mary Murphy’s judge interview, she says that once they’re in the Top 20, a dancer is not eligible to try out again for the show. Poor Paris and Tony and the other couples booted first! Billy performed in the Meet the Top 20, but not any official competition. Should that count? Do you think it will? Personally, I hope we get to see Billy Bell back next season. I admit to you that I had the idea for this post almost a month ago. Basically, my feeling was that So You Think You Can Dance is a great show. Obviously, if I didn’t think so I wouldn’t spend the time I do on this blog. However, I think I’m kind of missing some of the rawness that we saw on previous seasons. Certainly, it’s wonderful to watch great dancing every time out. I’m amazed at Kayla’s ability to do every style with so few technical flaws. It’s beautiful. However, it’s also really great TV to see someone kill a contemporary routine one night and then fall down doing hip hop the next. I like having that bit of unpredictable. Not to mention, the surprise that a ballroom dancer like Benji could do a broadway number to Hairspray as well as he did. I guess I’m just saying that it’s nice to have a little bit of the unpredictable. I like to see some imperfections and flaws. I like for people to be taken way out of their comfort zone and either rise up and knock our socks off or not. There’s a reason that people like roller coasters. They go up and down and make people go Wow! I think raw dancers offer that. Yes, I know this would mean that some very talented people wouldn’t make it into the top 20. That’s alright with me. It’s always going to be the case. I guess I just might rather have some people that are extraordinary in a couple styles and make me cringe in others than have everyone who is just average in everything. It’s a bit early for the Top 10 switcheroo, but having 2 out of 3 eliminations result in new couples has got me thinking. Who do you think would make interesting couples when the switch does happen (assuming anybody left is still around)? And while we’re at it, do you have a strong suspicion that an eliminated dancer would have faired better with a different partner? I’m curious to see what would have happened if Paris and Brandon had been partnered. I liked her – she seemed goofy – and I wonder if she could have brought out that side of Brandon that I haven’t seen in him since Natalie got cut Vegas week. What about Jeanine and Evan? They strike me as a couple that could be really fun and amazing together. Or Kayla and Evan – would that be dance heaven or a total disaster? Caitlin and Ade could be interesting together. I like her and Jason together, but Ade seems like a good mix of silly and strong and that could be really good for Caitlin. What would a Tony and Janette pairing have looked like? I almost can’t fathom it. Or Kayla and Tony? Perhaps he could have learned a lot from her, become a stronger dancer and lasted longer. I like the Randi-Evan pairing a lot, so maybe it’s blasphemous, but what do you think she’d dance like with Jason? Or Phillip? Or Phillip and Kayla? I previously posted a poll asking for people to vote for their favorite dancers from the SYTYCD top 20. We’ve had almost 3000 votes on the poll and the results of the poll are quite interesting. Take a look at this chart of the voting results and below it I’ll add some commentary on the results. First, I have to of course point out that this poll includes all of the SYTYCD season 5 top 20. Paris and Tony are already gone, but even that’s interesting. Paris was the least popular person and so I guess that’s why no one has come to the site complaining about Paris going home. Tony on the other hand was more popular than Paris, but still was near the bottom. I’m not surprised at all that Asuka and Vitolio are near the bottom. After their first performance that makes a lot of sense. Ashley for some reason has never been popular. Maksim doesn’t have the looks he needs to be more popular (see Dmitry). I should mention that the voting results are probably a little bit skewed in Jeanine Mason’s favor since I’ve had a lot of people coming to my site after searching for Jeanine Mason’s name. That said, you have to give Jeanine credit that a lot of people are searching for her name on Google. If they didn’t care about her, they wouldn’t be searching. Anyone who thinks that Evan doesn’t have a great shot at winning this season is crazy. This poll shows that. Phillip seems to have a nice fan following thanks to his previous performances on the show. 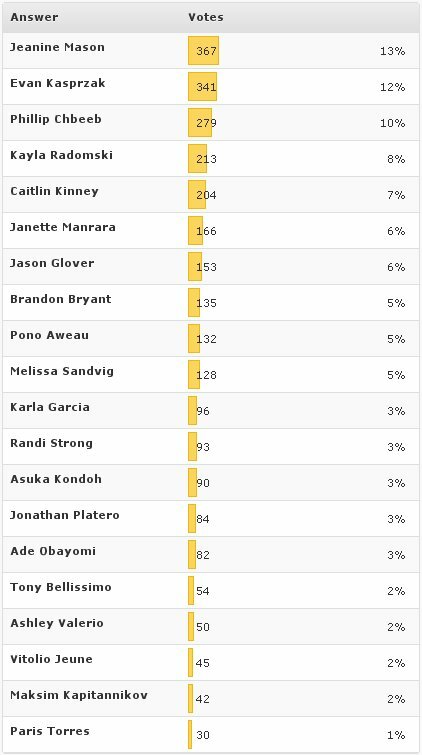 I’m a little surprised that Caitlin Kinney actually got more votes than her partner Jason Glover. I would have thought for sure that he’d be more popular than Caitlin (even if I’m obviously bias to Caitlin myself). Although, from the looks of it Kayla Radomski is quite popular herself. Another surprise for me is Pono Aweau sitting in the middle ground. I would have thought he’d be a bit more popular than that. Maybe it will just take some time for people to get to know him. Although with that said, I think he could potentially rub people the wrong way. All in all, I feel pretty good about these poll results predicting which people will make it to the top 4. We might see one or two people shift a little, but the top slots do seem to be some of the best dancers and the most popular ones as well. I should have posted these a while ago, but life’s been a little busy. I’m working on a couple interviews with choreographers now. Of course, that’s all an excuse. I’ll do better after the next eliminations. Paris Torres Elimination Interview – I love how candid Paris Torres is in this interview. This interview really made me like Paris more than I did before. Tony Bellissimo Elimination Interview – I love that Tony goes out on a limb and predicts Evan to do well in the competition. Tonight’s episode really flew by for being a results show. I think that they found a good mix of dancing and drama of who will be sent home. Props to them for that part. I enjoyed watching Tony dance, but he wasn’t over the top good. He was no Ivan to use the comparison that’s been often made. Ivan had this lovable street dancer quality and vibe that I think America learned to really love. Certainly it was Ivan’s time to go, but him and Allison Holker were a nice pair and great to watch. In fact, maybe Allison was the key to Ivan’s success. Tony wasn’t blessed with an Allison Holker for a partner, but someone far less talented (that’s a compliment to Allison, not necessarily a knock to Paris). In the end, Tony had to go. I’m glad that Nigel and the other judges didn’t try to play the storyline of improved dance. Jonathan going home would have been a travesty. As a side note, I thought his solo was one of the best. I’m sure many of the ladies will miss Tony, but at least you still have Nigel’s good looks. Something just wasn’t right about Paris from the start. No I’m not talking about her big chin, I didn’t notice it until later. Anyway, I don’t really know what it was for me, but I never got into Paris. She always just kind of rubbed me the wrong way. What I did like was her drive to dance and her desire to be on the show. As someone said in the comments of this blog (where the real action happens anyway), it’s like we saw her heart break on national TV. I have to applaud that kind of passion. With that said, I’m so glad that the Karla and Asuka remained. I really want to see what kind of performance Asuka can bring to the table since I think Tice really let her down with his choreography. Shane Sparks is back!! I just can’t wait until he’s choreographing the couple numbers. Love it!! The Sean Kingston dancers were the worst. Where did he get them? Sean needs to hire one of the choreographers from the show to help him out. I usually prefer the guest artist to have dancers since it’s a dance show. However, if they’re going to be as crappy as they were tonight, then leave them off. I was so happy that my So You Think You Can Dance power rankings were dead on with the bottom 3. I’m going to have to plan on making the rankings every week. I hope people enjoy them. Don’t forget to go and vote for your favorite individual SYTYCD dancer. That poll has some really interesting results.